Matt Edwards and his team celebrate more BRC success, this time in Belgium. Llandudno’s Matt Edwards has extended his lead in the Prestone MSA British Rally Championship by scoring maximum points on the Ypres Rally at the weekend. 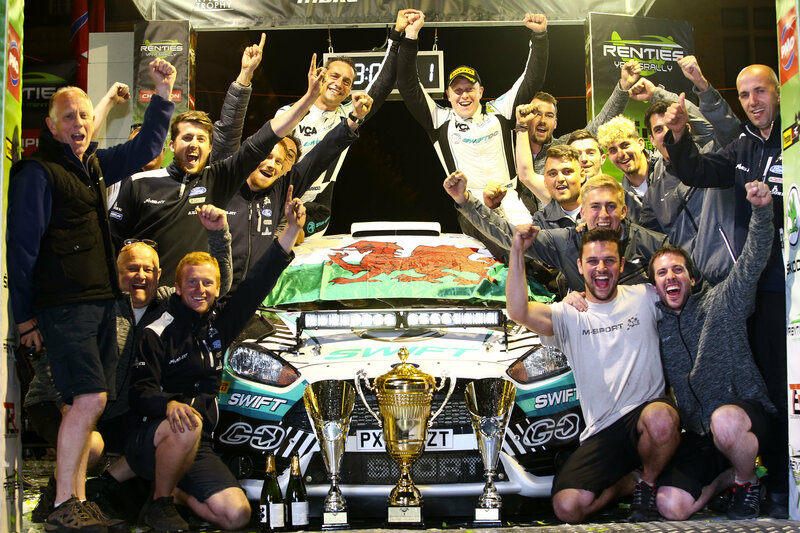 Co-driven by Abersoch’s Darren Garrod, the Welsh pairing claimed a last-gasp victory to seal their first BRC win on Tarmac – backing up their victory on the opening round of the series on gravel. What’s more, the M-Sport crew lifted the Tony Pond Trophy for the first British crew across the finish line in eighth in their Swift Rally Team Ford Fiesta R5. It was by no means an easy trouble-free win for Edwards. On the opening day, electrical problems forced the team into a complete wiring loom change at evening service, handing him a 1min 10sec penalty for going over the allotted time and putting him on the back foot going into the last day. Edwards recorded several impressive stage times to haul himself back into victory contention, but then hit power steering problems. He’d pretty much settled for second when Keith Cronin/Mikie Galvin picked up a late puncture in their Hyundai i20 R5, handing maximum points to Edwards. David Bogie/John Rowan came home second in the BRC section in their Skoda Fabia R5, while Cronin was third. FIA World Rally Championship leaders and local heroes Thierry Neuville/Nicolas Gilsoul claimed the overall Ypres Rally victory, but are not (obviously) registered for BRC points. Edwards is now 20 points ahead of Cronin after two rounds of the BRC. In the Prestone MSA Motorsport News Junior British Rally Championship, Newcastle Emlyn’s James Williams and co-driver Ross Whittock lit up the stages in their Vauxhall Adam R2. Williams broke his BRC podium duck in Ypres 12 months ago and a year on went two better to clinch his first Junior BRC victory. Despite a spin on SS11 and losing his grip on the top of the time sheets, a spirited fight-back allowed Williams to spray the champagne and claim the honour for the fastest R2 front-wheel-drive car on the event and the Junior Tony Pond Award. Williams played his BRC Joker in Belgium, giving him a further five points to catapult him up to seventh in the overall championship standings. “It’s just not going to sink in at all,” said a delighted Edwards at the finish. “Maybe it will in a few days. Just an unreal rollercoaster of an event. Thank you to everybody in the team for keeping us going, holding their heads high and believing we could get a strong result. I thought it was all over when we lost the power steering. This has been a very different win for us as from stage one it’s not gone right but I never doubted myself, the team or the car. You just have to keep going and take any glimmer of hope you can as when the car was on song, the event was unbelievable.